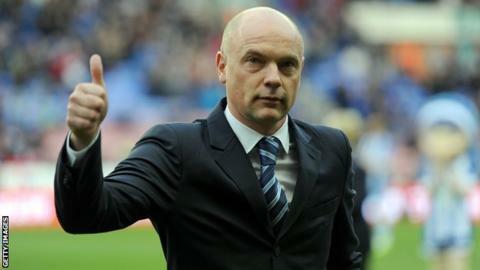 Wigan Athletic manager Uwe Rosler says his players' recent experience of big matches has them well prepared for the pressure of the Championship play-offs. Of the 12 players that featured in the Latics' FA Cup final triumph over Manchester City last May, seven remain with the club. They are Emmerson Boyce, Shaun Maloney, Jordi Gomez, Ben Watson, James McArthur, Roger Espinoza and Callum McManaman. They must now beat QPR over two legs for a chance to return to Wembley. "This squad know all about big games at Wembley and that can only be a positive for us," he told BBC Radio Manchester. Wigan were relegated last season after an eight-year stay in the Premier League - a period which involved several late escapes from the drop. In 2011, they stayed up courtesy of back-to-back wins, while the following year they won seven of their final nine league matches. "We are playing against a squad with a lot of quality that can raise their level in a big game," Rosler added. "But we have players who know all about last-day survival and we have some decent momentum and a positive frame of mind after finishing strongly against Blackburn."